These beautiful animals are unique to Aotearoa New Zealand. The world's smallest dolphin, Māui dolphins are friendly and playful, with distinctive black Mickey-Mouse-ear dorsal fins. But they could soon disappear forever - unless we act now. Scientists estimate that just 63 adult Māui dolphins survive today. They are on the brink of extinction. The Māui dolphin population has plummeted from around 1500 in the 1970s, when deadly set nets (also known as gillnets) were widely introduced to our waters. These critically endangered dolphins can be saved if the New Zealand government supports affected fishing people and communities to move to methods of fishing that are safe for dolphins and ends set netting and traditional trawling to across all of their known range. This is an emergency - these dolphins are in real trouble. Together, it’s possible to save them. To ensure their survival, Māui dolphins need to be protected throughout their range from set netting, conventional trawling, and risky marine activities like mining and oil exploration. This requires a genuine sanctuary from Maunganui Bluff to the Whanganui River mouth, including harbours, out to 100 metres deep. Now, less than 30% of their habitat is protected from set nets, and less than 8% is protected from both set nets and conventional trawling. Together, we can demand our government acts to protect these treasured animals, and helps affected fishing people and communities to switch to dolphin-friendly methods. Your help could be crucial to stopping their extinction. Ordinary Kiwis like you have power - the power to call government and business to act. Together, it's possible for us to save Māui dolphins. 1. 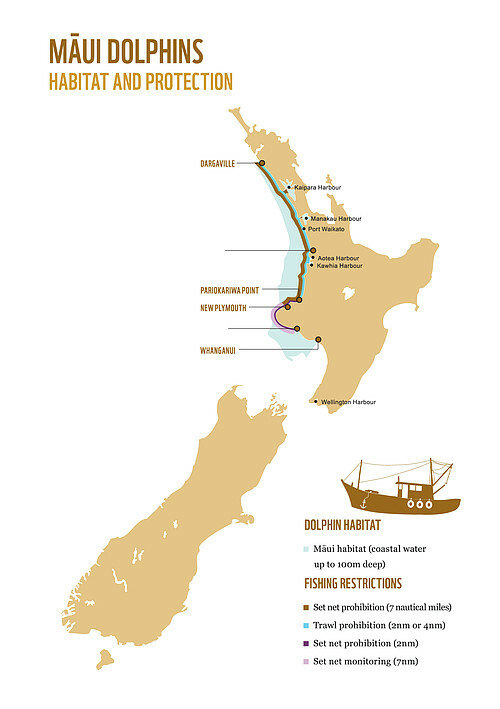 Write to the Prime Minister and to the Minister for Primary Industries urging them to support affected fishers to move to dolphin-friendly methods of fishing and extend the ban on set netting and traditional trawling to cover all the Māui dolphin range, from Maunganui Bluff to the Whanganui River mouth. You can write to the Minister or Prime Minister for free. 2. Write to the Minister of Conservation asking them to (1) implement a gillnet ban in waters up to 100m deep around the New Zealand coast, and (2) extend the existing trawl ban in Taranaki, from Maunganui Bluff to the Whanganui River mouth, out to 100m water depth, or 7 nautical miles at a minimum, including the Manukau Harbour. You could also urge her to increase observer coverage on trawl vessels. You can write to them for free. 3. Email or write to your local MP and ask him/her to support increased protection of Māui dolphins. 4. Report any sightings of Māui dolphins on North Island's west coast beaches this summer. Fishing through conventional trawling and set netting has pushed Māui dolphins to the brink of extinction. Entanglement in set nets and capture by conventional trawling fisheries is estimated to be responsible for more than 95% of all human-caused Māui dolphin deaths. 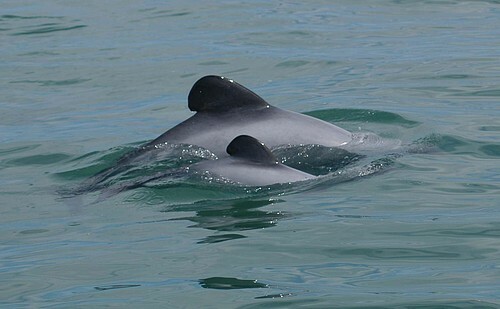 Oil and gas exploration and activity in Māui habitat also poses a growing threat, with the government granting an increasing number of permits inside the dolphin's known range. Other potential threats include boat strike, pollution, mining, acoustic disturbance and coastal development. 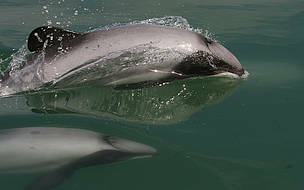 Māui dolphins, Cephalorhynchus hectori maui, were recognised as a distinct subspecies of Hector’s dolphins in 2002, as a result of genetic research by New Zealand scientist Dr Alan Baker. Before then, they were called the North Island Hector’s dolphin. The dolphins’ common name is Māui, after the Māori name for the North Island – te Ika a Māui. They are also known as Māui dolphins, usage WWF now favours in line with the Department of Conservation. The Māori name for Māui dolphins is popoto. With a total population estimated at about 63 adults, Māui dolphins are the world’s rarest marine dolphin. The Department of Conservation in 2016 released a new "abundance estimate", estimating that there were 63 Māui dolphins over the age of one year, with a 95% confidence interval of 57-75, meaning scientists are 95% sure that there is between 57 and 75 individuals excluding calves. The previous abudance estimate was 55, but as the confidence intervals for each estimate overlap, this does not mean the population has stablised or increased. It is very unlikely that more than 10 calves exist at any given time with a population level this low. It also means there needs to be about 20 mature adult females (over 7 years of age) for the population to recover. The fate of the world’s smallest and rarest marine dolphin is in our hands. If we don’t act now, we will see this amazing creature disappear forever. We stand for better protection for Māui dolphins. This includes engaging in the Threat Management Plan processes and Māui Dolphin Research and Advisory Group and advocating strongly for a real sanctuary for Māui dolphins where they can recover their population in safety from set nets, trawl fishing, and potential new threats including mining and seismic surveying. We also have a strong focus on advocating for industry transition to dolphin safe fishing methods, and calling for government to support this transition. This year, we released a Business Economic Research Limited (BERL) report, showing that it will cost as little as 0.03% of the government's budget to save Māui dolphins and support fishing communities through the transition. 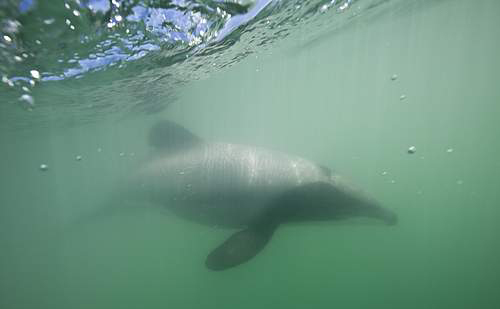 In 2014, a Colmar Brunton poll showed that 60% of New Zealanders are more likely to vote for parties that will protect Māui dolphins across their range. Māui dolphin – An inquiry to action (2014) is a cross-curricular inquiry-learning resource for schools. It is designed to support teachers and students to undertake their own inquiries into the protection of the world’s most endangered marine mammal – the Māui dolphin. This resource is designed for levels 2–4 of the New Zealand curriculum; however, it can be modified by teachers or facilitators and used at all levels of the curriculum. While the curriculum links focus on science and social studies, teaching about this critically endangered dolphin can be integrated into any curriculum learning area.